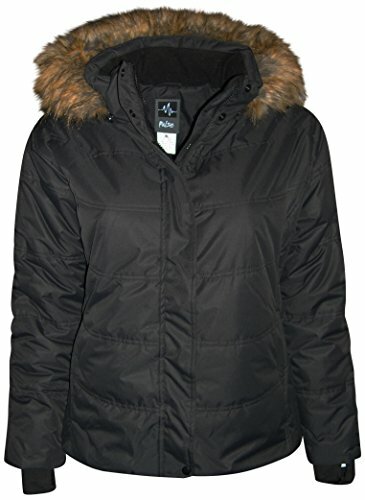 Pulse Women's Plus Extended Size Ski Coat Aspens Calling (3X, Black) by Pulse at Lamont Design. Hurry! Limited time offer. Offer valid only while supplies last. A fashionable coat for the curvy woman! Absolutely beautiful women's plus size winter coat, by Pulse. This coat is loaded with technical details. A fashionable coat for the curvy woman! Absolutely beautiful women's plus size winter coat, by Pulse. This coat is loaded with technical details. Retail is $199. Pulse women's Plus Size and Extended Plus Size Aspens Calling Jacket. 1X fits 16/18, 2X fits 20/22, 3X fits 24, 4X fits 26/28, 5X fits 30/32 and 6X fits 34. Beautiful, high quality heavy, warm winter coat. Removable, insulated hood. Faux Fur is also removable. Interior snow skirt, waterproof, breathable, side zippered vents, interior wrist cuffs, media pocket, pass ID pocket.